Comments: "Tricks and Routines With Instructions for Expert Performance by the Amateur" A good beginner's book. 3 Introduction to Magic: Short tips on how to learn, misdirection, practice, etc. 30 Eleven Cents: Three pennies and two dimes; arranged alternately. Moving eleven cents each time, the pennies and dimes are separated in four moves. Easy, for those who know the system; but not for others who try it! 37 The Tell-Tale Sugar: One lump of suger is chosen from a number. The magician discovers the selected lump. 78 The Fifth Card: From five cards, one is mentally selected. The magician discards four. The one he keeps is always the one the spectator chose. 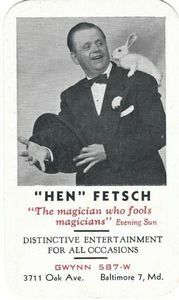 129 A Collection of Tricks: Supplementary magic, forming a new collection of clever tricks for various occasions.